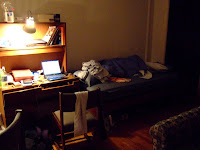 $2000/month 的 Shadyside Inn 也滿了. 只好乖乖的去 craiglist 爬 post, 打電話, 寫 mail 看有沒有好運氣找到住的地方了. 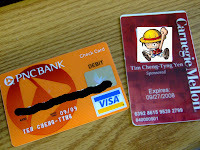 今天終於拿到我的Debit Card 跟 CMU ID. 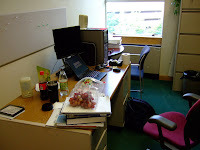 另外順便拍了一下Office(Roberts Engineering Hall Rm250)跟即將要搬走的地方. 昨天跟今天都有下雨,但房間裡還是熱啊.